My award winning work has been exhibited in many art and textile shows in Europe, Canada and the US. Trained as an artist, social scientist, architect and urban planner, not surprisingly, my fabric work continues to investigate themes grounded in these ways of knowing the world. Most notably, I am fascinated by human interactions: with the places in which we live—both city and rural landscapes, with ourselves and our inner landscapes, and with the interactions among each other. I love to work with fabric as I love its feel, and accessibility—we are all clothed in and housed among fabric. 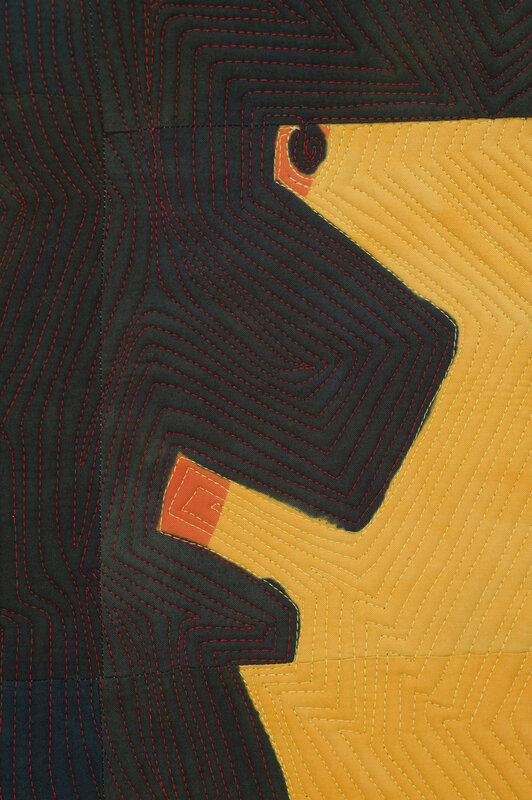 On my website, I present work that is pieced, employing traditional quilting techniques, and work that is fabric dye printed and painted. Many of these pieces are also quilted. All the work tends to be large scale, bold, yet simple and direct with strong, large figures interacting often with an equally strong ground. I love color and use it confidently, powerfully, and often playfully. Scale is important to my work, as the large pieces allow the viewer to be in or next to the work, provoking a visceral curiosity about who this may be? what’s going on? as well as realizations of personal likeness and similarity. I am currently a full time studio artist and textile arts curator after a rich career working with some of the most inspiring people leading social change nationally. A native New Yorker but a long-time passionate Philadelphian, I have a studio and live with my family in the Italian Market area. I am interested in collaborating on installations, wall murals, curating and so on. If you are, I look forward to hearing from you; drop me a note.